Kofi Annan spent his life in the service of humanity. It is a grievous blow to learn that his life has now come to a sudden end, but his legacy will surely endure to inspire people for many years to come. 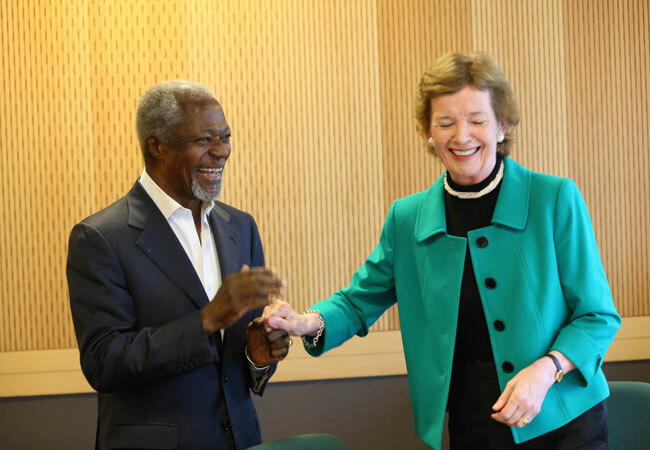 I had the honour of knowing and working with Kofi Annan for many decades; as President, UN High Commissioner for Human Rights, UN envoy roles on conflict and climate change, and as a member of The Elders, the group of global leaders founded by Nelson Mandela to work for peace and human rights. In every role and in every context, Kofi’s commitment to justice and equality shone forth. I saw it most recently on what was tragically to become his last mission with The Elders, to South Africa and Zimbabwe. He was in poor health but determined to keep going, to meet and listen to as many people as possible at this critical time for both countries. We travelled to Johannesburg to mark Mandela’s centenary, taking part in public events, meeting young grassroots activists as well as President Barack Obama, who gave this year’s Nelson Mandela Foundation Annual Lecture as both Kofi and I had done in previous years, and South Africa’s new president, Cyril Ramaphosa. In all these meetings and conversations, Kofi kept insisting that peace, human rights and development are inextricably intertwined. You cannot have one without the other two. Mandela understood this intimately, of course, but in recent years we grew concerned that South Africa’s leaders had lost sight of this fundamental truth, to the detriment of the country’s cohesion. 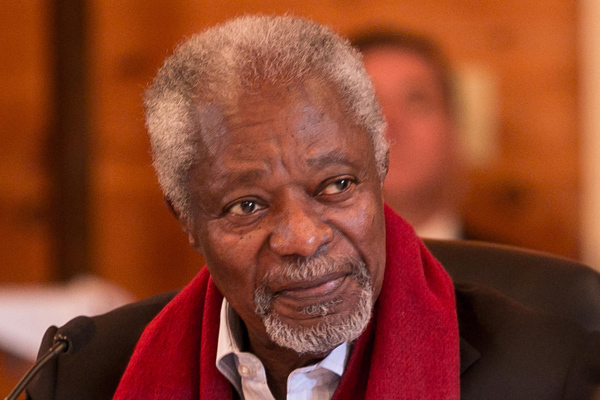 "Kofi kept insisting that peace, human rights and development are inextricably intertwined." I believe that Ramaphosa understood Kofi’s message, and I dearly hope that South Africa will once again put human rights at the centre of its development plans. Our mission to Zimbabwe was even more gruelling, coming just over a week before the most important elections since independence in 1980. Kofi was deeply concerned about the polarisation in society, the persistent allegations of electoral malpractice and intimidation, and also at the rise in hate speech and attacks against women candidates and officials. Even when his health worsened, he was determined to stay the course, meeting the presidential candidates, electoral commission officials, diplomats, civil society groups and media. When violence tragically erupted after polling day, Kofi was quick to react with renewed calls for calm, restraint and dialogue. He knew from his previous work in Kenya that this was the only way to break out of an electoral impasse, restore peace and build the foundations for a truly sustainable and accountable democracy. It is a cruel loss that his wise words will no longer be heard in Zimbabwe, but their power resounds and resides; if political leaders across the divide now heed his call and act together in the common interest of their people, it will be a fitting legacy for this lifelong peacemaker. Kofi’s legacy will also live on in the work of the United Nations, the institution he led so ably as secretary-general from 1997 to 2006. As the current secretary-general Antonio Guterres said so warmly in his own tribute, in many ways Kofi Annan was the United Nations. He was the consummate diplomat, listening with respect and attentiveness to all interlocutors but firm in his commitment to the UN’s values. "He was the consummate diplomat, listening with respect and attentiveness to all interlocutors but firm in his commitment to the UN’s values." Never was this more apparent than in the period around the US-led invasion of Iraq in 2003. Kofi was adamantly opposed to what he viewed as an illegal act of military aggression, and rightly fearful of the consequences of invasion and occupation not just in Iraq but across the wider Middle East. 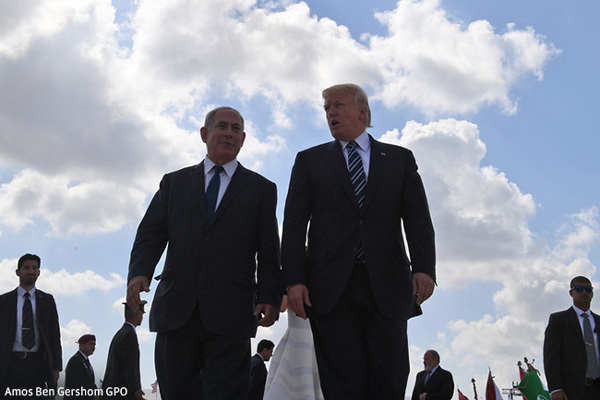 He maintained this opposition despite sustained and often personal attacks from the administration of then-US president George W Bush, which persisted for many years afterwards. I know that Kofi took no pleasure in being right about the wisdom of invading Iraq. He was never motivated by vindictiveness. Instead, he was profoundly distressed by the war’s disastrous aftermath, the sectarian bloodletting that so scarred Iraq, the systemic violation of human rights and the rise of ever more vicious strains of extremism. Yet thanks to his determination and refusal to compromise his independence, the UN retained its integrity and is still in a position today to work for peace and justice in Iraq and across the Middle East. After a long life exposed to some of the worst aspects of humanity, one might easily have expected Kofi Annan to lapse into despondency or fatalism. Yet the opposite was true; he constantly declared himself to be an optimist, however challenging the environment in which he was working. In our troubled and turbulent times, Kofi would often quote Yeats in his speeches, including the line in The Second Coming that “the best lack all conviction, while the worst are full of passionate intensity”. But I believe his life is a rebuke to the great poet. 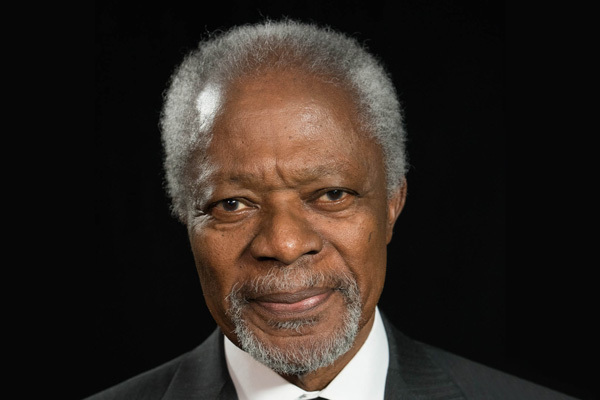 Kofi Annan was driven by the passionate intensity of the very best convictions: that peace, justice and human rights are not only to be desired but essential values that must be fought for. His was a courageous, inspirational, warm and humane life that will echo down the generations. In our grief today, this is something for which we can give the deepest and warmest of thanks.